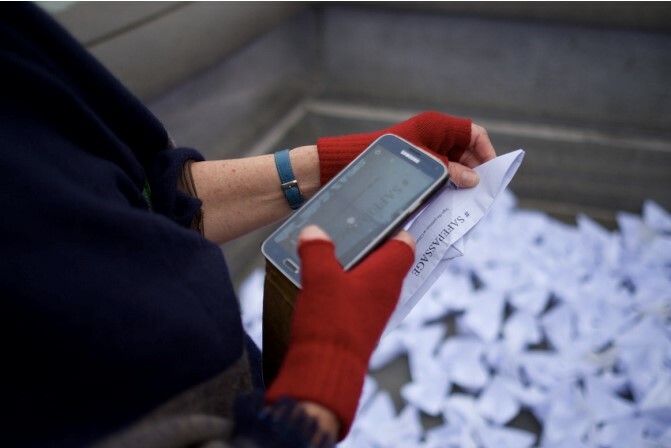 On March 22, 2017, a postgraduate Art & Politics Collective from Goldsmiths University London staged a public art intervention on Parliament Square in Central London. This was a response to the down voting of Heidi Allen’s amendment to the Children and Social Work Bill in late February as well as preceding decision by government to close the Dubs Scheme, capping the number of lone child refugees at 350 by the end of this financial year. The immediate response by local councils, reconfirming their commitment to the scheme and the open letter urging government to change its course, was signed by over 200 public figures including Carey Mulligan, Sir Mark Rylance and Gary Lineker and was a beacon of hope. But the protest must continue! The project was born out of an interest in the power, or lack thereof, of memorial sculptures, that serve as a reminder of the past and an investigation into how art can be involved in giving back a voice to these silent statues. The starting point were the Kindertransport memorials at Liverpool Street Station, a stark reminder of the solidarity and generosity of humankind in the darkest hour, placed in a location of constant transit and movement, rarely noticed today. 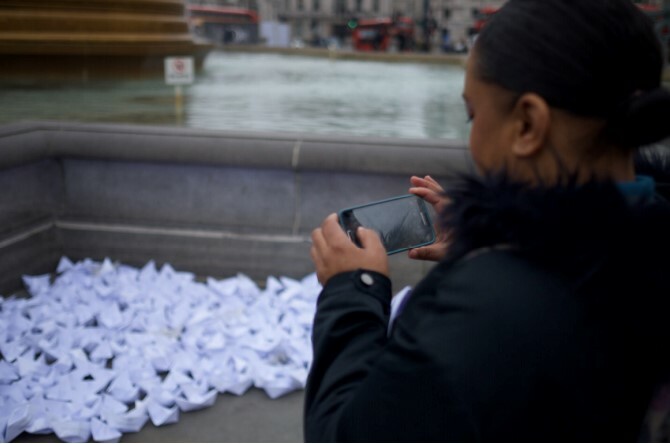 With support from Help Refugees as well as Citizens UK’s Safe Passage project, the Goldsmiths Collective left more than 350 paper boats as a temporary arts protest in front of Parliament. 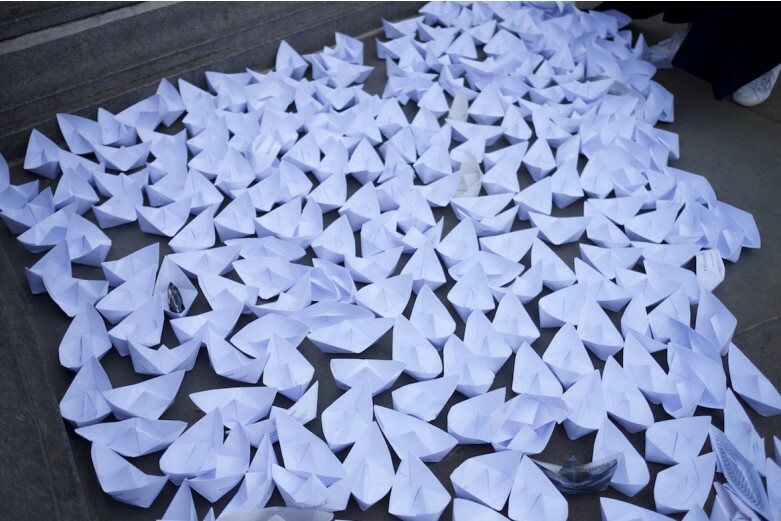 The playful aspect of creating paper boats when you’re a child, combined with the fragility of the material in water as well as the boat being vessel and main form of transport for refugees to cross over to Europe are what fed into the collective’s project idea. This has been a means of protest in Norway, Spain, Hungary, Italy and the UK, drawing attention to the drownings during the dangerous crossings. 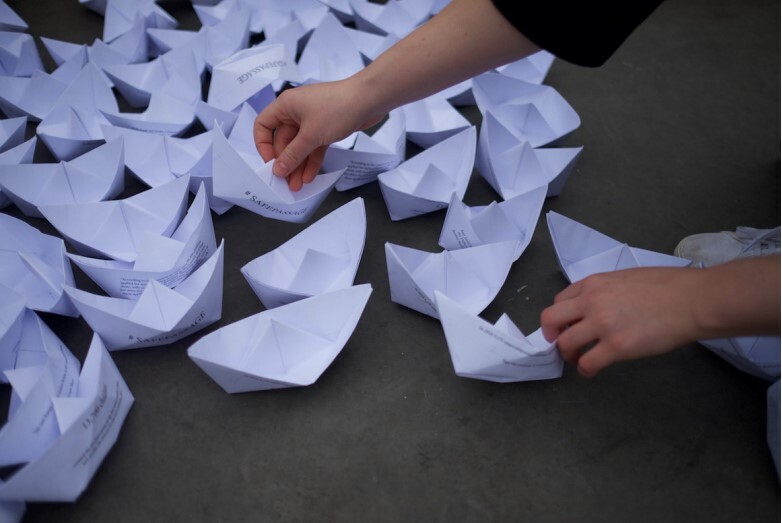 The collective is using the paper boats as vessels for important messages, as they are printed carrying information, images, facts and figures about refugee children in Europe. 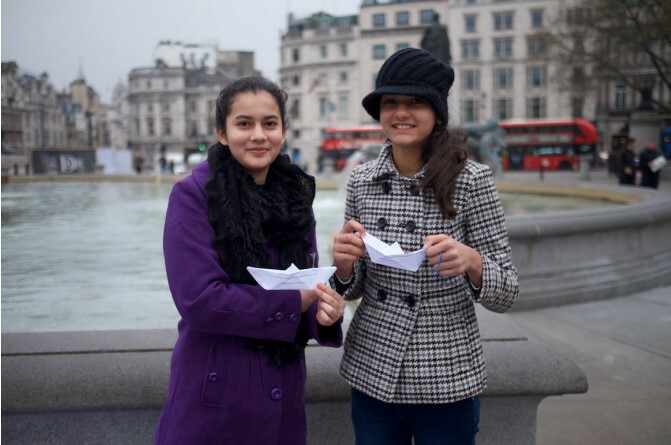 During the peaceful intervention protest, the public were invited to create their own paper boat, symbolising the constantly growing number of refugee children and to leave it as a message to Theresa May and her government. We will point to Citizen UK’s and Lord Alf Dubs’ petition urging Theresa May’s government to not abandon the Dubs Scheme, which is only 15,000 signatures short of its goal of 70,000. This was the first of a series of planned actions in collaboration with Help Refugees UK to take place leading up to the High Court challenge of the government’s decision, brought forth by the charity scheduled for hearing at the beginning of May by Justice Holman. Through routes Safe Passage have opened, 1,050 refugee children have arrived safely in the UK, while an estimated 13,700 children crossed the Mediterranean in the first seven months of 2016 and double the amount for the same period of 2015. Around 200 unaccompanied refugee children have been given sanctuary in the UK under the Dubs amendment, and at the end of March the Home Office published strict criteria for the remaining 150 children allowed into the country. What we are calling for is the ever so important need to help unaccompanied children in Europe, who are fleeing war and terror in their home countries, like what the British government did for the children of persecuted peoples at the dawn of the second World War.